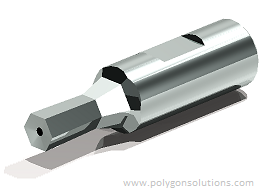 Explaining about different types of rotary broach cutting tools and their commercial applications, this paper details the selection criteria for a company while choosing rotary broach cutting tools. It includes a comparison between steel broaches and carbide broaches. The paper advises companies about the benefits of ordering a customized broach. Different types of customization of broaches including coating, size, and shape are explained. The paper concludes with an explanation for the requirement of sharp corners in the hole of the work piece, and ways to eliminate the problem.